Ouch. Somewhere in the middle of a party I was enjoying, Sierra Nevada stealthily switched from twist-off to pry-off bottle caps. Seriously, whenever they actually made the switch (possibly accompanied by some press release on which no eyes would ever be laid), the switch happened for me in between consecutive bottles from the same fridge, at the same party. Hand-shredding frustration ensued. OUCH. 1. Twist-off and pry-off caps pretty much look the same. It's only with careful inspection that the difference can be discerned, and that's not the kind of detailed analysis that tends to happen when beers are being downed. Why not make them easily, obviously distinct? 2. Tiny little heads-up label! I wish I'd gotten a photo of this, but the "PRY OFF" text on the bottlecap was a friggin' joke. Itty bitty, dim, and not at all different from all the other text that litters the labels of these beers. I doubt a single person has read one of those "PRY OFF" warnings prior to opening a bottle - but plenty, like me, probably found it afterwards while searching for some explanation of their sudden inability to do the twist (off). There better have been a damn good reason for this change, Sierra Nevada! Man, I need a beer. 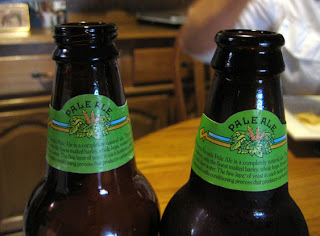 That was one of the coolest things about SV Pale Ale -- which I am drinking right now btw -- that it was a great-tasting full quality beer and it was twist-off to boot! -"The new pry-off crown offers an increased oxygen barrier due to its density and oxygen barrier properties." -"It took a lot for us to give up the convenience of our twist-off cap." "It took a lot for us..."
For who? The six-figure marketing VP? The CFO in hand-crafted A. Testoni loafers? Are these pinstripe clad, Glenmorangie swilling, Viagra popping, my-assistant-carries-the-Blackberry, boy-you-should-have-seen-the-traps-at-St. Andrews, Shylocks really serious? Time was, all you had to remember in your bleary haze was that domestic=twist off. Now we can't even depend on that adage. I digress. I have noted a phenomenon across myriad Bacchanalian fests. Alcohol weakens the hand and forearm muscles such that as the night draws on, the ability to twist off the cap actually fades. This invites the telltale zig-zag contusions on one's palm or the search for a bottle opener when one is least mentally equipped to search. Well stated, Mr. Jackson. It's certainly easier to believe that the statement "it took a lot for us..." refers to the business risk of alienating customers than the personal risk of the same. Though they'd love to have us believe otherwise! I can relate to shredding my hand! I just got my 12 pack after work (it is Friday!!) and got home to open one up and gave it 2 good attempts by hand and one with a towel. 0 for 3 so far. WTF, I say to myself because my daughter is in the next room. They are making these harder and harder to twist off lately. I used a bottle opener and instantly realized there were no threads on the bottle. Wait, it's a pop off? Am I crazy? Did they always used to be this way? I had to do a Google because I know they were twist before. Found your blog! I'm happy because now I can re-use the bottles for home brew. Kudos to Sierra Nevada (but they should have warned us). David, kudos on being able to find a silver lining on this one - I didn't even know that pry-off bottles can be reused for home brews, but twist-offs can't! And I agree, they should have warned us - bigger letters saying "PRY OFF," or a picture of a bloody shredded hand on the box as a cautionary example! Ouch, indeed! Now one of the few things I learned at Chico State is no longer =D What kind of person lets their Sierra Nevada's sit around long enough for oxygen to become a factor? A bigger warning was definately warranted, although I am not about to try twisting another cap off for a long time.